An eventful Race 1 of a back-to-back doubleheader. 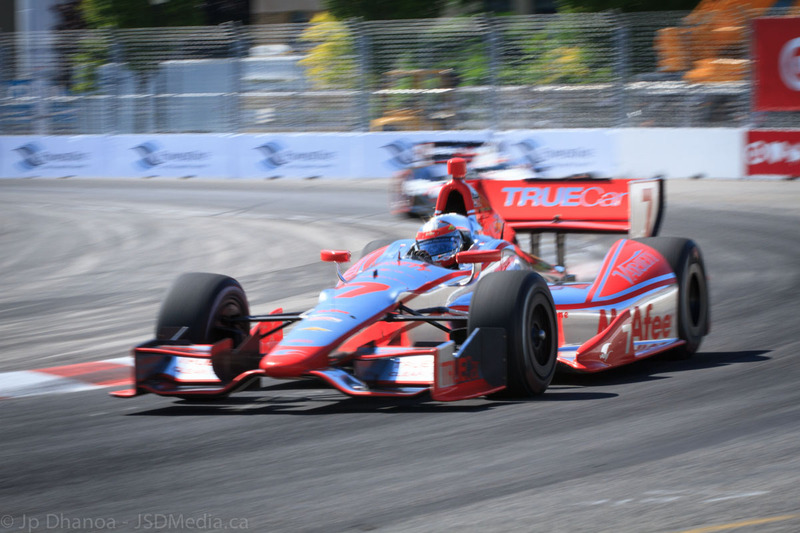 An aborted standing start, a gearbox failure, a broken trophy at the podium, a 25 second penalty for a podium finish driver; Race 1 at the Honda Indy Toronto was full of interesting moments. 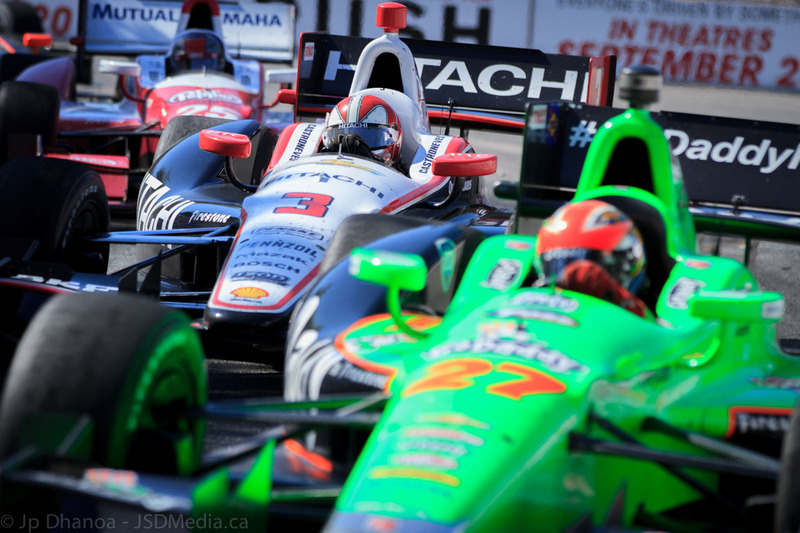 Saturday’s Race 1 actually began with the Indy qualifying race on Friday. It was an eventful timed run for many of the drivers with Dario Franchitti taking pole position. 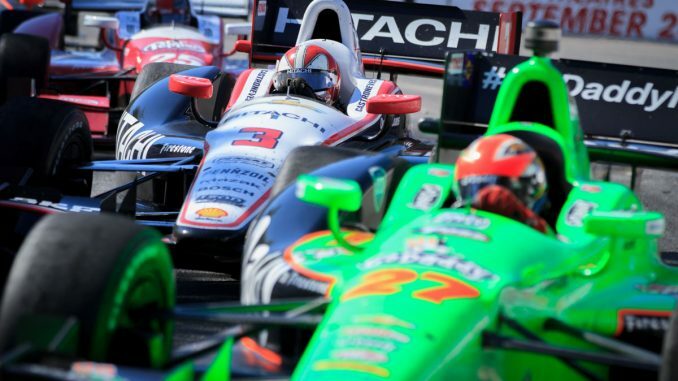 Joining him in the Firestone Fast 6 –considered the best starting positions for a race– were Sebastien Bourdais, Will Power, Tony Kanaan, James Jakes and Scott Dixon. 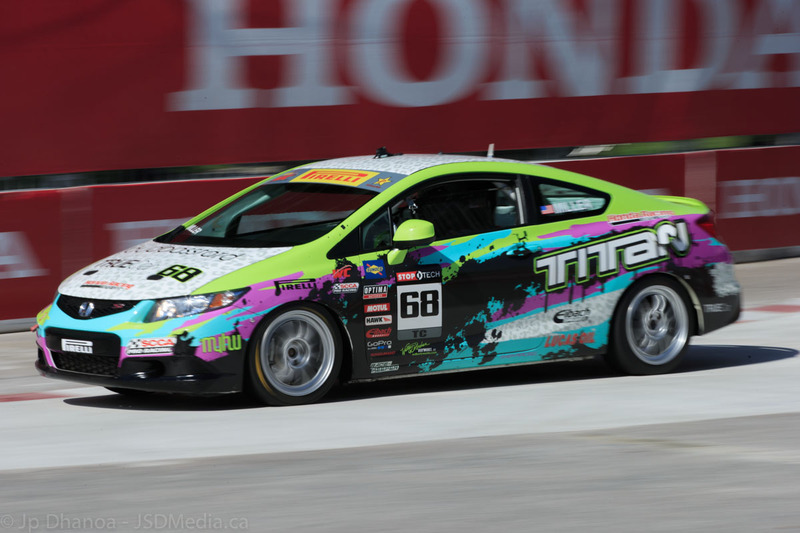 It was the man in the fifth starting position however who took the win for Race 1 on the streets of Toronto this year. Scott Dixon was a man of smiles despite the turmoil and disputes that had churned up behind him. Dixon overtook race leader Sebastien Bourdais on Lap 78 on the tight and treacherous 1.7-mile, 11-turn temporary street circuit and held off the Dario Franchitti on a Lap 84 single-file restart to earn his 31st victory to tie Sebastien Bourdais, Franchitti and Paul Tracy for seventh on the all-time Indy car list. 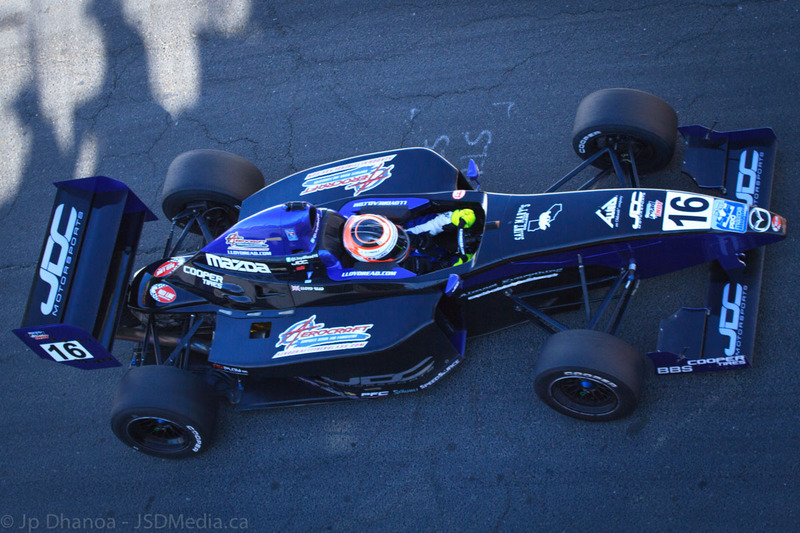 Dixon won six days earlier on the wide and fast Pocono Raceway 2.5-mile tri-oval. His last back-to-back victories occurred in 2008 at Edmonton and Kentucky. If Dixon sweeps the doubleheader this weekend, he’ll be presented a $100,000 SONAX Perfect Finish check. 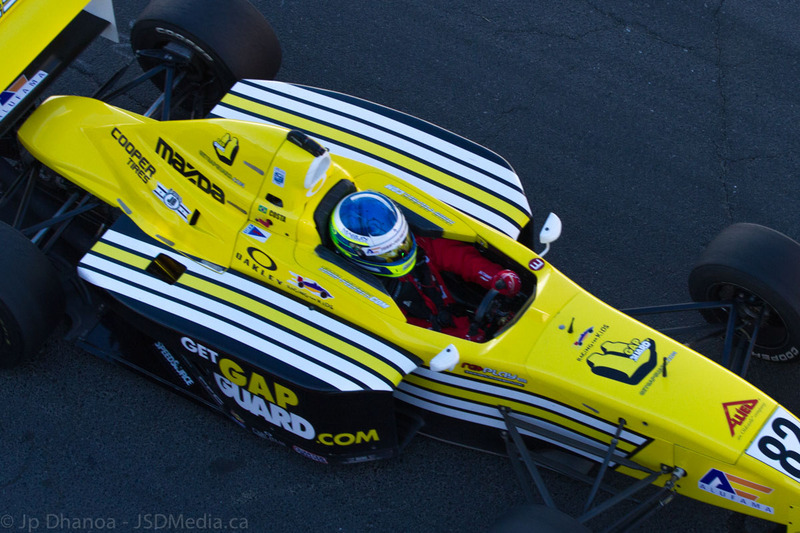 Bourdais was 1.7007 seconds back for his best finish since rejoining Indy car racing in 2011 in the No. 7 Dragon Racing car. Bourdais’ last victory was at Mexico City in 2007. Franchitti, who earned the Verizon P1 Award in the No. 10 Target Chip Ganassi Racing car, was informed while standing on the podium that he was assessed a 25-second blocking penalty on the final lap that dropped him to 13th. An understandably frustrated Franchitti had this to say about the situation right after the race “this is another problem, IndyCar has problems”. 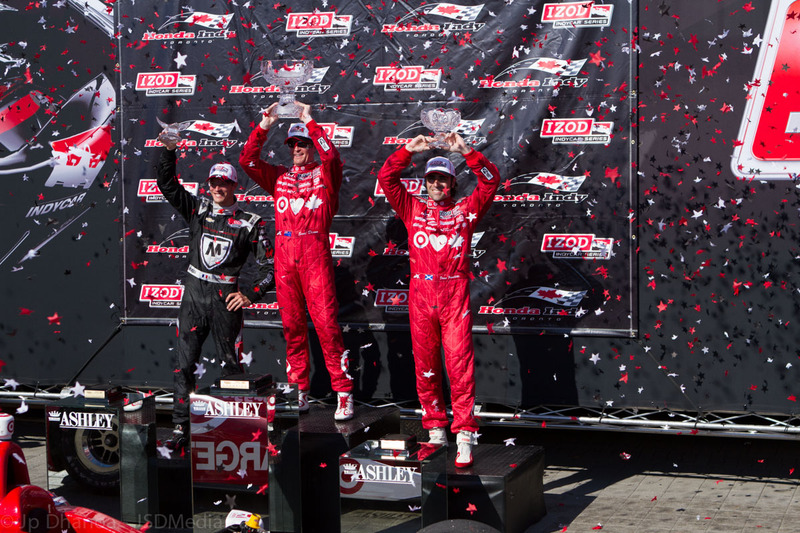 Following a meeting with IZOD IndyCar Series officials later than evening, in which telemetry data and video was reviewed, Franchitti’s second consecutive third-place finish was reinstated. 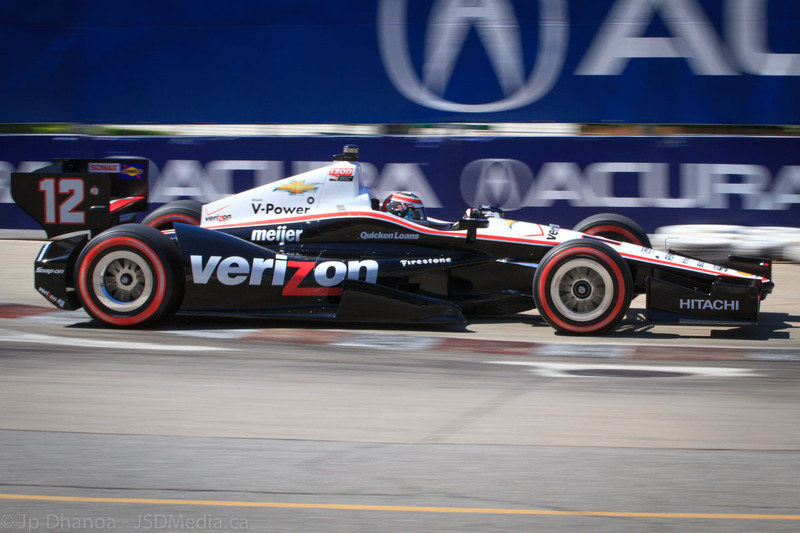 Helio Castroneves, the championship points front-runner entering the 12th event of the season, increased his lead from 23 points to 39 with a sixth-place finish in the No. 3 Hitachi Team Penske car combined with Ryan Hunter-Reay’s 18th place. 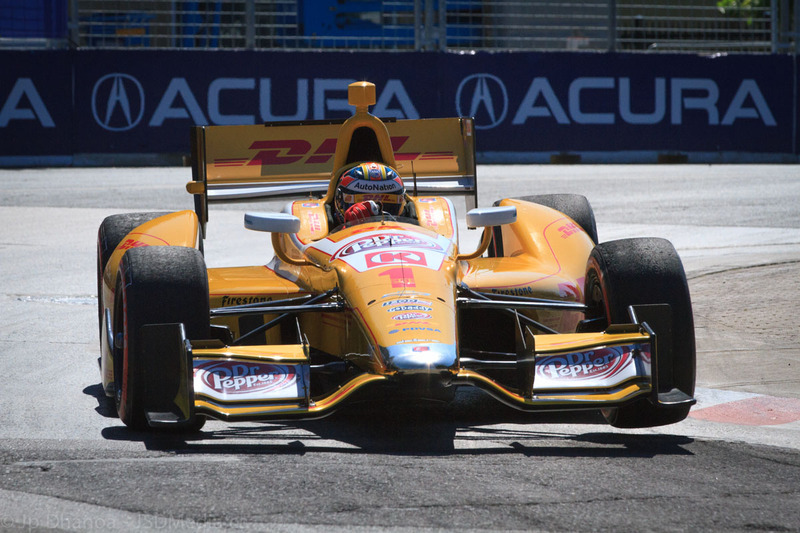 Hunter-Reay encountered a string of problems, including stalling the No. 1 DHL car twice leaving his pit box and making contact with the Turn 3 tire barrier on Lap 79. “Not an ideal day. 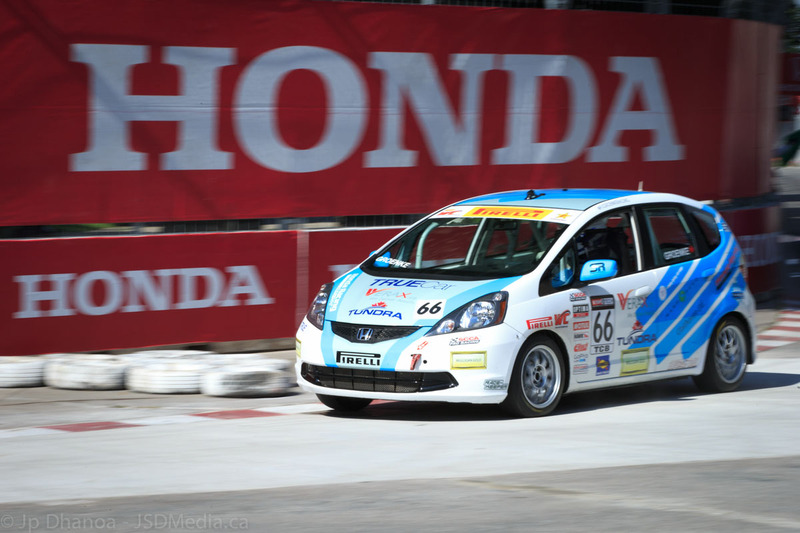 We had two stalls in the pit lane and then were making some moves, making our way up on track, and then racing with E.J. (Viso) there I just got held down in the marbles on the inside and collected all that stuff on my tires,” said Hunter-Reay, who won in 2012 on the streets of Toronto. “I came down into (Turn) 3 and locked up the right side. The much talked about broken trophy happened when Bourdais was handed a crystal trophy on the podium that wasn’t attached to its base. Race organizers watched in horror as the cup toppled off the base Bourdais was holding, hit the stage, stayed intact, then rolled off the stage and on to the hard ground where it shattered. A gracious Sebastian Bourdais was overheard saying that it wasn’t the trophies that mattered, but the win itself. Honda Indy Toronto sponsors and suppliers of the trophies William Ashley Fine China will surely double check all their trophies for Sunday’s Race 2. What The Heck Is Going On With Selena Gomez?